2. The cone is the area where impacts are expected. Many people (most?) have no clue what the cone really means. I keep seeing comments like "the NHC is going to move the cone" this way or that. The NHC doesn't move the cone. The identical cone is always there, no matter how much uncertainty exists. We definitely need to get rid of the cone and use something that would indicate true uncertainty in the track, or that would indicate true potential impacts (like a probability of wind impact). Such a "cone" might change shape with each advisory, depending on current uncertainty. It could be bifurcated (indicating two possible tracks) at times if it is based on models. The cone represents the probable track of the center of a tropical cyclone, and is formed by enclosing the area swept out by a set of circles (not shown) along the forecast track (at 12, 24, 36 hours, etc). The size of each circle is set so that two-thirds of historical official forecast errors over a 5-year sample fall within the circle. The circle radii defining the cones in 2016 for the Atlantic and eastern North Pacific basins are given in the table below. wxman57 wrote: We definitely need to get rid of the cone and use something that would indicate true uncertainty in the track, or that would indicate true potential impacts (like a probability of wind impact). Agreed 100%. I basically cringe whenever I see someone mention the cone as if being "in" or "out" of it has any practical meaning for what conditions they can expect. The NHC PWI is better. However, it has the same issue as the cone given that it is based upon the deterministic forecast. It does not say anything about true uncertainty. It is still based off of historical errors. To arrive at the size of the cone, NHC's own track forecast errors are averaged over the previous five seasons at each forecast lead time: 12, 24, 36, 48, 72, 96, and 120 hours. The problem is, the cone doesn't really represent the probable track based upon CURRENT uncertainty. The current track uncertainty could be far greater (like Joaquin) than the average error over the past 5 seasons. And, of course, the cone, as it's drawn now, is currently shrinking each year. This means that more and more of a hurricane's impacts are being felt well outside the cone. Clearly, there needs to be a better way to visualize uncertainty based on current steering patterns (ensembles). Excellent example of where Hurricane conditions were expected WELL outside of the cone and very near landfall! One must look deeper than the cone for their safety and the NHC should do something about this because TWC and everybody else uses the cone!!! New for this season, the NHC's "standard" cone now includes the wind field of the storm. 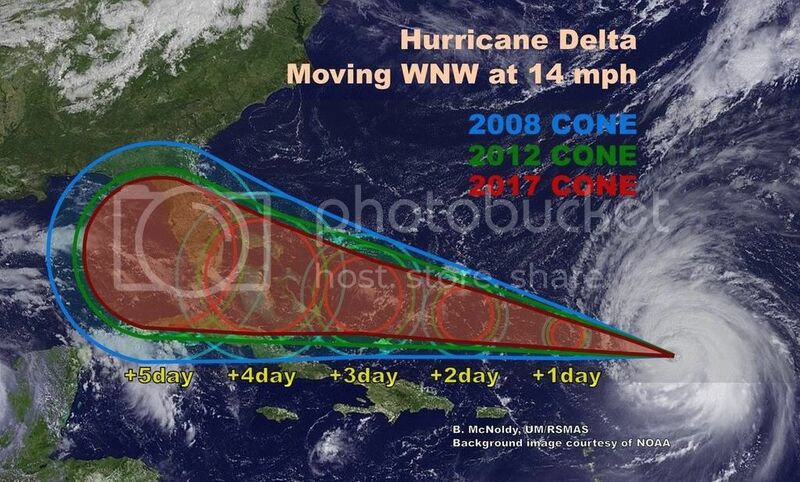 Note how much wider the wind field is than the cone itself, which shows how being outside of the cone DOES NOT mean the storm's winds will not affect you. I am only a tropical weather enthusiast. My predictions are not official and may or may not be backed by sound meteorological data. For official information, please refer to the NHC and NWS products. Those wind graphics still do not display the risk area of winds. It does say the areas that are forecast to receive impacts, which is an improvement for sure. Thank you for explaining this. You and other professionals would be doing a great public service if you could write this in terms that the average person can understand and then start to get the word out. Maybe local Mets and emergency management groups could be a place to start. As simply an interested member of the public, I would certainly share any such explanation on my FB page. I hear far too many people in FL right now saying "we're out of the cone," and believing it's absolute fact because that cone is quite a distance from the state at the moment. That could be correct, but not for the reasons they think. It's still prudent for people to pay attention. I agree we need a cone that represents the uncertainty at the time the advisory is made. If the models are in good agreement 5 days out, the cone should be smaller to reflect that. Conversely if the models diverge at 5 days out, the cone should be wider accordingly. But I agree too many people focus on the line and whether they are in the cone or not. Irma is a good example. SE Florida moved out of the cone with line going through the west coast of Florida. A lot of folks in SE Florida were surprised how strong the winds got. The cone represents the probable track of the center of a tropical cyclone, and is formed by enclosing the area swept out by a set of circles (not shown) along the forecast track (at 12, 24, 36 hours, etc). The size of each circle is set so that two-thirds of historical official forecast errors over a 5-year sample fall within the circle. The circle radii defining the cones in 2017 for the Atlantic and eastern North Pacific basins are given in the table below.